As some of you may know, I started back to college in January with the intention of getting my degree in one of the biological sciences. Working for the JREF as their volunteer managing blog editor has been very inspiring for me. I learn so much by proofreading and editing articles before they are published. But, even though I could always find sources for evaluating the information if I had questions, I wanted to know more. At the age of 46, going back to school is daunting. My life experience gives me the advantage in my Lit class but in Biology and our labs, I feel like a total noob. The other students are so much more familiar with lab procedure than I am. Fortunately some of the others have taken me under their wing and we do labs as a group. Measuring and marking test tubes is a new experience. Even in high school, we didn’t have labs like these. One of the experiments we did was to test for lipids and I couldn’t fathom WHY vegetable oil wasn’t reacting the same way milk did. Yes, yes, I know. Lipids are animal fats. For me, that somewhat embarrassing misunderstanding led to learning. I will ALWAYS remember that lipids are animal fats because of that. That same sort of embarrassing error is the reason I will remember that viruses are not considered living organisms. Viruses do not self-replicate and must co-opt the DNA of other organisms in order to reproduce. These are just a couple of the things I’ve learned over the past several weeks. I’m looking forward to exploring the cell and learning more about how everything fits together. As i learn, I’ll share my experiences in weekly posts right here, so stay tuned as the Fledgeling Skeptic takes wing once more. Those of you who are friends with me on Facebook may have noticed my status earlier today. Sometimes things get a little overwhelming for me and I just want to curl up in a little ball and hide. Between the new Ben Radford/Rebecca Watson kerfluffle and the DJ Grothe/Greta Christina thing, I’d had enough for one day. The disagreements themselves were one thing. Everyone has opinions and the fact that they differ simply means that those people have different ideas. This is a good thing. As was pointed out to me, it means our community isn’t full of cultish automatons. The comments that some people have made after said opinions were voiced is something else totally different. Personally, I find it frightening and intimidating when I read threats of violence and misogynistic words leveled against another woman that I have a passing acquaintance with. I’m a female blogger and skeptic too so, to my mind, I could also be targeted by these same people simply because I share the same anatomy. That’s not an unreasonable concern. I’ve already received a death threat by Mabus (Yeah, I know…who hasn’t?). But the point is that when people stoop to that level, it makes me feel unsafe, as though, if I dare to voice my own ideas, I will be treated the same way. Fortunately I have good friends who remind me almost daily that all men are not like that. Matt Lowry, who writes for me at the JREF blog, wrote an excellent post about this on his blog, The Skeptical Teacher. I fully support his new project, “More Than Men” and urge you to do the same. OH YEAH!?!?! WELL SCREW YOU TOO!!! MY ALL CAPS SHOWS JUST HOW SMART I MUST BE, HOW MUCH I DISAGREE WITH YOU, AND HOW STUPID I THINK YOU ARE PERSON-I-JUST-MET-ON-THE-INTERNET!!! ANYONE WHO DISAGREES WITH ME DESERVES TO BE THREATENED WITH HORRIBLE THINGS YOU WOULD NEVER, EVER SAY IN PERSON!!! HA, I WIN THE ARGUMENT!!! SO THERE!!! And this is why Gerg is my hero of the week. Honestly I laughed so hard I was sneezing my comfort food of choice – caramel popcorn. Gerg said that this makes an excellent blog comment “safe word” when things have gotten out of hand. I couldn’t agree more. It’s an excellent tension breaker. I still maintain that the best college course I ever took was psychological statistics. During the course we learned how to create and read psychological studies, including things like what a population is and how big a population should be before the results can be extrapolated to the affected population at large. We also learned why double-blind studies were important. You can read more about that type of study and why they are relevant study types here. Let’s start with what a “population” is. In the layman’s world, a population refers to how many people live in a town, country or even the planet. In a study, the population refers to the number of people participating in the study. Say you have a study testing the effectiveness of a new anxiety medication and you have 100 people in the control group, 100 people in the placebo group and 100 people receiving the actual medication. In this case the study population is 300. As study populations go, that’s still a relatively small size if we’re going to extrapolate the data to nearly 30 million people in the US alone that suffer from some level of anxiety that requires medication. A decent study size would be at least 1000. Even then, one study is NEVER sufficient. When evaluating research, you need to consider the ENTIRE body of research, which should include 4 or 5 good studies with a large population that has been conducted with controls in place. Let’s take a look at someone practicing quack medicine. Dr. Steven Novella of Skeptic’s Guide to the Universe and NeuroLogica fame recently posted an article that included information about the Burzynski Clinic and the doctor who is touting a “unique cancer cure” that has no evidence to back up its effectiveness beyond anecdotes from patients. Dr. Novella points out that Dr. Burzynski is still doing “preliminary research” after 30 years. This is a red flag. After 30 years of testing, he should have been out of preliminaries a long time ago IF his treatment had any positive effect. As if that wasn’t enough to send you running for the hills, they also claim that the Journal of Sleep Diagnosis and Therapy has released a study claiming that “study participants who wore Philip Stein watches fell asleep faster, stayed asleep longer and felt more refreshed in the morning.”. It sounds impressive, doesn’t it? Well let’s just take a look at the study, itself, shall we? Notice, if you will, under “Methods”, the population of the study is a grand total of 28 people. So let’s break down these percentages and see what the numbers tell us, shall we? 96% of the study group reported positive results. So out of their total study population, the percentages apply to 26.88 people. Let’s be generous and round it up to 27. 64% of study participants reported waking up feeling refreshed. Of the study population, that’s a TOTAL of 17 (leveled from 17.28) people reporting this result. 43% fell asleep faster – that’s 12 (rounded up from 11.61) out of 27. 43% reported staying asleep longer- Is that the SAME 12 people? 18% reported lying awake less at night- a grand total of 5 (rounded up from 4.86) people. Conclusion: This study is unreliable at best. The population is far to small to draw any reasonable conclusion about the effect this product claims. There is also only this one study which, as we know, is not nearly enough data to come to the conclusion that is asserted on the Philip Stein website. If you read the study conclusion itself, the researcher even asserts, “…the current overall results are not statistically significant…”. On the website, however, “A just-published study in Sleep Diagnosis and Therapy Journal (2010; V5 N5, 27-29 Breus and Rubik) provides the first clinical evidence that Philip Stein watches featuring Natural Frequency Technology provide improved sleep. Uhm, no. A study this small is not evidence. Evidence is testable and repeatable. They have not repeated positive results on any statistically significant level whatsoever. Without evidence, they are just blowing hot air and trying to sell a product that doesn’t do what it claims on that level. Last time I talked about the different news aggregators you can use to gather stories. 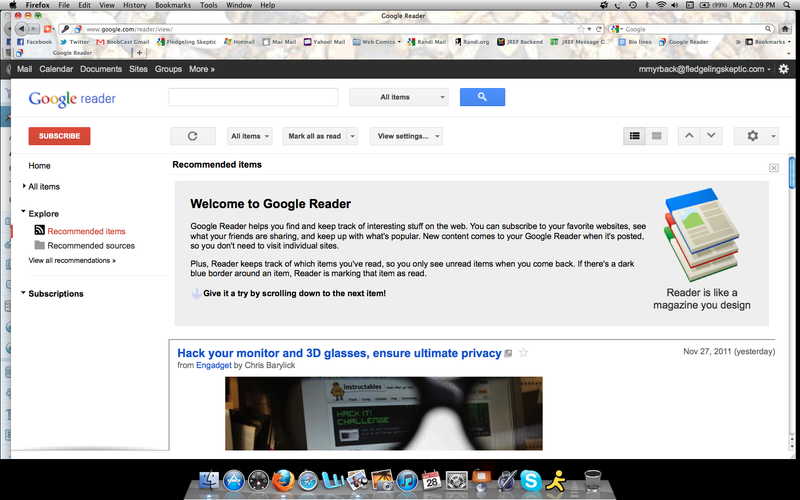 Today I’m going to talk about Google Reader since this is the aggregator I use. I’ll also explain step-by-step how to set it up and customize it for your specific needs as a skeptic news outlet. Now that you have your Reader ready to go, you need to subscribe to content. To do that, click on the “Subscribe” button in the upper left-hand corner. A box will pop up asking for search terms or a URL. It is much faster to type in the search terms that you want, such as “skeptic”. That way you get a list of the most popular blogs. Once you have the list, just click the small, blue “subscribe” button under the site description. If you want to subscribe to a specific blog you don’t see in the list, just type in the full URL (ie http://randomskepticsitehere.com). You’re almost ready to start posting skeptical news stories. Now, it’s time to pick a specialty. If you look at bloggers, you’ll notice that many of them choose just one area such as ghost hunting, medical pseudoscience or commercial and product claims. The world is a very big place and trying to cover everything, even when you’re just sending out articles to social media, gets overwhelming really fast. So find something you love to read about. My personal posting specialty is biology. So I send out articles about the latest discoveries in animal and human biology or new medical discoveries. I also send out the occasional article on psychology news because those are frequently linked to brain/body function and their relationships. Once you have a specialty and you’re getting news stories, it’s time to start spreading the news! Take a look at the screen below. You’ll see a list of news stories that Google Reader has gathered for you. Click on the Blue Article Title and that will take you to the original article. Once there, look around for the Facebook or Twitter icon. Different blogs have them in different places so you’ll probably have to hunt for it. Usually it’s at the bottom of the article, but sometimes it’s on the left or right. Or even at the top, so just keep looking until you find it. Once you’ve found it, click the icon and share the article with your friends. I would urge you to at least skim the article to make sure you are not sharing inaccurate or poor information. Always make sure your story comes from a credible source. Next week, I’ll be talking about how to evaluate scientific research so that you can be sure what you’re sharing is good information. For the next few weeks I’ll be talking about a new way you can spread the word about science and skepticism using social networking. While blogging is an excellent way to get your message out, according to Tim Farley, there are over 700 different skeptic blogs and websites. That’s a lot of voices to compete with and you have to yell pretty loudly and wave your arms pretty wildly to get a decent-sized audience in a small community like ours. 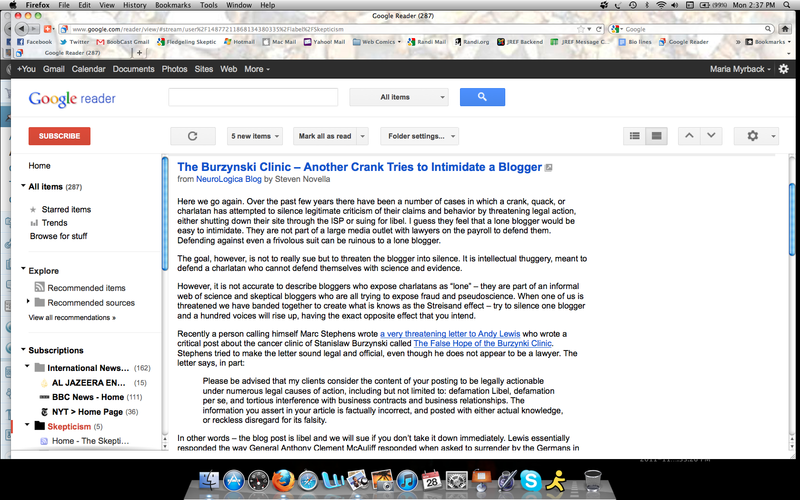 Believe me when I say that blogging is time consuming. You have to do the research, check the sources, make sure that the information is up to date and reliable and then you have to sit down and write a concise post that isn’t so long that it’s just one big wall of text and not so short that it leaves out pertinent details. THEN you have to insert links to your sources and maybe a photo or a video. It’s a real headache. This is why I only post one piece a week now. There is, however an alternative to blogging. You have probably seen your friends posting news items in their Twitter stream or Facebook Timeline. There may even be someone you know that does this all the time. There is always some interesting, newsworthy tidbit they are sharing. So how do they do it? There’s no secret to it. Every online news outlet, even the minor ones, have the icon, the icon and usually others besides. Sometimes you have to hunt for them, but they are usually there. We’ll talk more about that in a later installment. First, I want to talk about news aggregators. An aggregator is a piece of software that can pull in news stories from multiple sources and collect them in one spot. Probably one of the best known, and the one I have personal experience with, is Google Reader. It’s easy to program and, if you use iGoogle for your homepage, you can have those news items dropped right on your desktop. Everyone is going to have different needs, so you should experiment and find the right news aggregator to fit your requirements. Wikipedia has a list here that compares different types of aggregators so you can choose for yourself which ones you want to play with. You’ll probably want to stick with the web based software because that will make it more convenient when it comes time to start sharing stories. So far I have done some preliminary exploring on the Wiki list above and discovered a few things about some of the listed aggregators. Bloglines, though it is listed as web-based, must be downloaded and installed. I was unable, in my brief search, to find a download link. FeedDemon and FeedReader: I run on a Mac so I am unable to test out Windows-based software. Sorry. But please do experiment. This might be the right aggregator for you. Gnus: This seems to be kind of complicated but it also combines your news feed with an email reader. This website gives fairly detailed info on how to set this up. Mozilla: If you use Firefox or Thunderbird, there’s a News Reader add-on called Sage. Newsbeuter: This is for UNIX people. You can download different modules and piece together what you want yourself if you are so inclined. NewsFire: For you Mac users that don’t mind shelling out a few bucks, there’s NewsFire. Safari: This Mac-based browser also has a setting to bring news right to you though I haven’t found a way to customize it the way you can customize other browser newsfeeds. Windows Live: As with other browsers and mail apps, Windows live also provides a news feed. Though, as with the browser-based feeds, this isn’t very customizable. As I mentioned earlier in this article, it is all a matter of finding what works best for you. 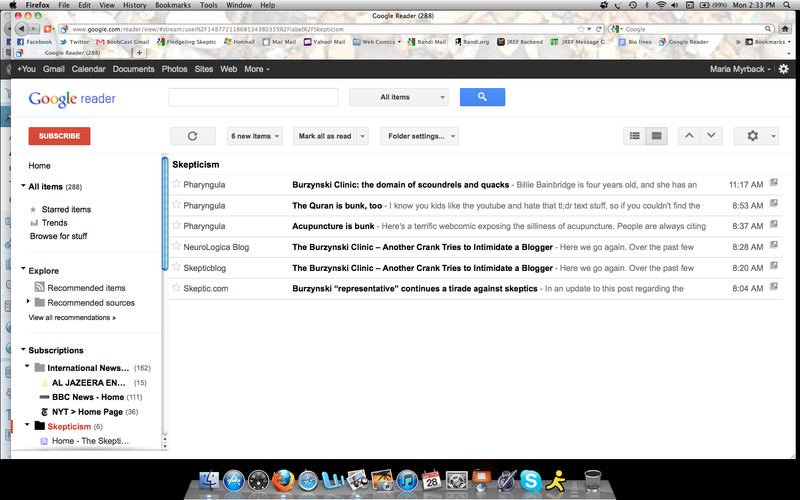 Next week I’ll discuss how to set up your chosen aggregator using Google Reader as my personal reader of choice. Yeah, yeah. No surprise there. Just as when May 21st turned out to be a bust, now Camping and his crew are doing their usual spin. At the end of this post you will find today’s email from Harold Camping to his followers explaining why Sunday, and not Friday is when the end will REALLY come. Notice that in the email he chooses option #2, which confirms his biases. This is another classic case of confirmation bias. He took an option, that while still uncomfortable, also let a possible solution that made him feel better. Camping, like most other human beings, is dealing with cognitive dissonance in the best way he knows how: by offering himself two solutions, one of which his cognitive dissonance will push him towards because it is more comfortable. The idea that his Biblical Calendar is wrong, probably causes pain. Perhaps even physical pain. At the age of 90, he may not be willing or able to take option number one. Rather than using this as a learning experience, Camping is allowing his confirmation bias to make his decisions for him. It also doesn’t help that he has people willing to encourage his biases. You can see an example of this in the letter he sent out (below). Though, since the debacle of May 21, the number of followers has dropped drastically. Another reason that Camping is wrong is that he is using flawed data as a basis for his theory. Using the Bible as a basis, rather than historical documents, is faulty at best. As many times as that book has been re-written and re-interpreted, there is no way it could be considered an actual historical document. As has been discussed before on this site, make sure you are using a credible source for your research. The Bible is NOT a credible source. Unfortunately Camping doesn’t seem to realize this. A credible source is one that is scientifically testable and verifiable by other credible sources. While there are some parts of the book that may be historically accurate, books like Revelations are not credible sources. 1. The biblical calendar of history discovered about 40 years ago is incorrect in some way. 2. The biblical calendar of history is correct, but we are missing some additional information. have not had much time to yet consider, but I have received via email one possibility given below. I am just emailing this very unproven and incomplete at this time possibility in the email below. Bob James and I have been talking and believe that there is a possibility that we will be “caught up” on resurrection Sunday. We’ve compiled a few verses but basically it’s a similar pattern to the completion of the Passover Feast. Christ was taken on a Thursday and died on a Friday completing the Passover Feast. His resurrection came 3 days after Thursday – not Friday. The Feast of Tabernacles has a similar Thursday / Friday pattern with the extra day referenced in 2Ch 7:10. Could it be that our resurrection will also be 3 days after Thursday – not Friday? We know that the Feast of Tabernacles is complete. It celebrates the fact that all of His elect have come into the fold and that our dwelling place is with God. Now we wait for the resurrection, just as there was a wait for the resurrection of Christ. We are identified with the same 3 days in Matt 12, Matt 16, and Lk 11. The resurrection of the believers are “the sign” given at the end of the world that the end has come. In Hosea 6, God references the third day which identifies with our resurrection. We know that this will only come after God has saved all of His elect which would have been completed with the end of the latter rain. It’s only then that God will bring the resurrection of our bodies. Much as there were rains that produced the salvation of our souls, our bodies will be resurrected gloriously and our salvation will be complete. Another 3 day reference is found in Esther. We are told that the Jews were allowed to arm themselves and to destroy their enemies beginning on the thirteenth day. Interestingly, God adds 2 more days to this time in Esther, totaling 3 days. Since none of the scoffers have heard of Christ coming on Sunday, He will come as a thief in the night to a greater degree for the lost of this world. Perhaps others can add to this. This was done quickly and all corrections / additions will be greatly appreciated. Once again, this is being presented as a possibility since it may very well occur within the next few hours. In addition to the Bible study below by Mr. Hernandez and Mr. James, Joshua 1 is very important — here the Jews had to wait to the 3rd day to enter the Promised Land; also please look at Exodus 19:1, 11 and 15 [from Mr Carman]…God came down the 3rd Day. Others have located dozens of verses aimed at the importance of the 3rd Day, as Christ was raised then —Mr. Berry reminds that each Pentecost was on a Sunday, as was Resurrection Day [Easter]–Christ arose when it was DARK on Sunday—before dawn [it’s nearing that time in a few hours in Jerusalem]…watching and waiting. Note I circulated this study BEFORE Oct 21st had come and gone. Our friend Harold Camping is still claiming that the world will be destroyed by fire tomorrow, October 21. He already failed to predict the Rapture on May 21. By the end of the day, everyone was still here even though lots of people jokingly left clothes on the ground in random places as though people had been spirited away. Camping later claimed that it was a “spiritual rapture”, or a “rapture of the spirit”. There does not seem to be any reference on what that term means precisely. One could guess that means that the spirits or souls of believers were taken on May 21, leaving their bodies behind on auto pilot. Camping still claims that the rapture (albeit a different kind) DID occur on May 21. Therefor Judgement Day is still scheduled for tomorrow. “Probably”. Yes, he is already hedging his bets according to an article in the Global Post. He has said nothing else about the Judgement of non-believers and sinners. According to the above line, our Judgement, as with everyone else, is to cease existing. Which is what scientific evidence shows us anyway. 1. New message on Luke 11:5-13: Does this mean salvation has been and is possible during the 5 months.” This message was done in response to multiple people sending me emails on this subject. It can be accessed from here. 2. Our prolific writer, Brother Robert Fitzpatrick has completed a new article entitled “May YouBe Like The spider,” which is accessed in left-had column of site here. I really look forward to seeing all of you who are God’s elect very soon in paradise. As I contemplate what is most likely to take place within the next couple days, I have to remind myself that we walk by faith and not by sight because it is all just too incomprehensibly awesome to be able to put one’s mind around. Our human natures alone would not allow us to believe in such things, but through the faith of Christ, we believe it, for after all, it does come from the very Word of God, and to my knowledge, no one has legitimately disproven the biblical calendar of history. Is it possible we do not see all things clearly? Absolutely, for as long as we are still in this world, we see through a glass dimly. Nevertheless, I am convinced that whether one is saved, or whether one is just an open-minded seeker of truth, if all the evidence and proofs for the accuracy of the biblical timeline are carefully examined, there is just too much support from the Bible to think this is just some falsely devised scheme of men. That is not possible! May 21, 2011 was the beginning of The 5 Months of Judgment Day. There is no longer any possibility for salvation! October 21, 2011 is The End of the World by fire. Currently I am working on an article titled “Supertaster Or Discerning Palate?” in which I run an experiment to see if I am what is known as a supertaster. A supertaster is someone who has a higher than average concentration of taste buds. About 25% of people have this. Right now I am holding off because I didn’t have the right equipment to run the experiment properly. Anyone in my Facebook timeline knows how much I hate shoddy science. I will also be having someone else assisting me with a flashlight and magnifying glass instead of trying to do it myself. I’ll also be including some information on why this is more than just a novelty and how it can affect you or your children who might be supertasters, themselves. As you may know, Mabus was arrested for “allegedly” making death threats and given a 30 day court-ordered psychological evaluation. It has been 30 days since the article was published in Global Montreal and he is due back in court today. I am waiting with baited breath for the results of this long, drawn-out fiasco. As I find out information I will pass it along. To see Bachmann’s full comment, visit here.